Collecting antique typewriters has really come of age in the last twenty years, as the appreciation of antique machines has grown in our technological times of smooth cases and blinking lights. There were a few typewriter collectors fifty years ago but they could have been counted on one hand. 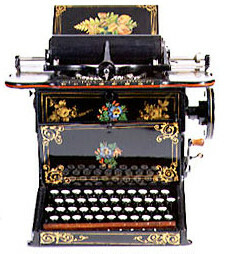 Pictured left: Odell 2 ~ Chicago, 1890 This attractive index typewriter is nickel plated with an Art Nouveau styled base. Today there are over 500 typewriter collectors spread around the world. The largest group of collectors are found in the US and Germany, but there is strong interest throughout Europe, especially in Italy, France, Spain, and Switzerland. Most typewriter collectors seek machines from the 1880s and 1890s, the first twenty years of typewriter manufacturing, a time when the fundamental design of the ‘modern’ typewriter had yet to be discovered. During this time there was a major effort by many pioneering machinists and engineers to create a viable typewriter for a world that was ready for this revolutionary machine. There are perhaps 400 different models to collect from this age of experimentation. These typewriters were manufactured in many industrialized countries, in particular the US, England, and Germany. Today, the values of these machines are affected by condition, rarity, and desirability. With prices ranging from a few hundred dollars, to into the thousands for the rare machines. However, for those interested in acquiring an early typewriter at a modest price, there are a number of intriguing and historically important typewriters that can be had for a few hundred dollars, including the Blickensderfer ($150 to $250), Hammond ($150 to $500), and Odell ($400 to $600). Ebay is a good place to look for these and others – click to view Antique Typewriters on ebay. By 1910 the design of most typewriters had become standardized as a result of the emergence of the ubiquitous and brilliant Underwood 1, which appeared in 1897. All typewriters from now on, right up to the invention of the personal computer in the early 1980s, would ostensibly have the same look and function as the Underwood, the age of experimentation was over. This November, a very special typewriter went for auction in Germany. It was the typewriter of US inventor Abner Peeler. His very strange typing machine was made in 1866 and is one of the very first typewriters to ever be made. This typewriter was not manufactured though and only one example is known to exist. Mr. Peeler also has the distinction of mailing the first typed letter in the US, which was sent on June 19, 1866. Pictured right: Commercial Visible ~ New York, N.Y., 1898 This attractive machine types from a type wheel, that is easy to remove, allowing for a quick change of font. To make an impression, a spring-loaded hammer behind the carriage swings forward, striking the paper and ribbon against the type wheel. The ‘shrewd men’ were right but it would not be his machine that would herald in the age of the typewriter; that would be a few years later in 1874 when the American printer Christopher Lathem Sholes had his very functional typewriter, the Sholes & Glidden, manufactured by Remington & Sons. Mr. Peeler also created the very first airbrush machine and his impressive self-portrait, from a photo, is the first airbrush picture in history. One can read more about the Peeler collection and see his typewriter and self-portrait at www.abnerpeeler.com. The keyboard provides an essential means for one to communicate and is used by more people today then ever before. Keyboards are arguably one of the most important tools in the world, a tool that represents our personal communication in this technological age. The keyboard truly connects the planet. But what did the first keyboards and typewriters look like and how did they evolve? 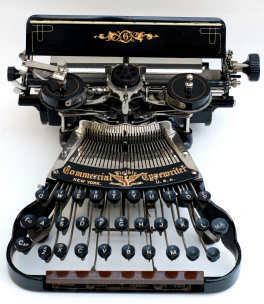 Typewriters from the 1930s and 40s all look pretty much the same, they “look like a typewriter”. With four rows of straight keys, single shift and front strike visible (type-bars hit the front of the roller allowing one to see what they have just typed). Typewriters have not always looked like this though. Just imagine if you, never having seen a typing machine, were asked to design one. How might it look? In fact, the standard big, black machines that you might be familiar with such the Underwood and Remington were the result of many years of mechanical evolution. as a normal keyboard; black keys are for capitals and white keys are for lower case. During these early years of discovery, ingenuity and mistakes, over four hundred different typing machines were produced to print the written word. Among them were machines with curved keyboards, double keyboards or no keyboards at all! The first typewriter patent was issued to an English engineer, Henry Mill in 1714. He outlined the concept of the typewriter when he registered a patent for ‘an artificial machine for impressing letters one after another, as in writing, whereby all writings may be engrossed in paper or parchment, so neat and exact as not to be distinguished from print.’ However, this machine was never made. Many experimental typewriters were built and used during the first 75 years of the nineteenth century but none were produced in quantity. This was about to change though, as the technology for mass production had arrived and the need for fast, accurate business communication was growing. What was needed was a person to bring together all of the successful elements that had been developed so far. This person was Christopher Sholes, an American printer living in Milwaukee. After a shaky start with a number of experimental, prototype machines, Sholes was advised by his financial backer Glidden, to have his typewriter produced by E. Remington & Sons. This was wise advice as the Remington factory was well equipped to mass-produce complex machines, having already set up production facilities to manufacture guns and later sewing machines. With the American Civil War over and the need for guns diminished, Remington was eager for new business opportunities and embraced the challenge. Pictured right: Sholes & Glidden ~ Remington & Sons, Ilion N.Y., 1874 This was the first practical typewriter to be manufactured. In 1874, one thousand Sholes & Glidden typewriters came out of the Remington factory. 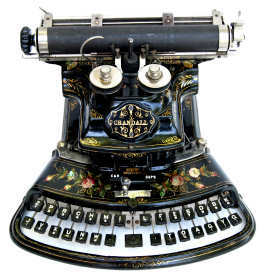 This typewriter was a beautiful object, all black and covered with hand painted floral decorations. A cast iron foot treadle operated the carriage return. The influence of the sewing machine on its design was clear. To see what had been typed, it was necessary to lift up the carriage and look under the roller, as the type-bars struck on the underside. 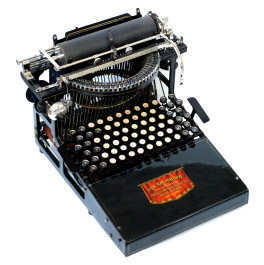 The Sholes and Glidden was also the first typewriter with the “Qwerty” keyboard. The purpose of this layout was to minimize the type-bars from clashing with each other while typing, by separating the type-bars for letters that are frequently typed in sequence, for example ‘t’ & ‘h’ and also letters that are frequently used. Attempts were made to introduce more sensible keyboard layouts once typewriter designs had evolved but it was too late, people had already learned one way and understandably did not want to learn again. The start was slow for the typewriter. The Sholes & Glidden was not a quick hit and sold very slowly to start and then with only moderate success. 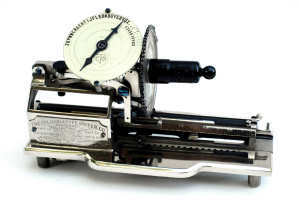 Competition did not arrive until 1881, when the Caligraph 1 appeared. However, during the following twenty years everything changed, as the industrial world realized that the typewriter was indispensable and that there was a huge market to satisfy. Full keyboard typewriters were very expensive in their day, costing between $60 and $120. In comparison a clerk’s wage was $5 a week, horse drawn carriages cost between $40 & $70, and a massive cast iron coal furnace for ones’ house was $50. With few secondhand machines to be had, a less expensive machine was needed. Thus, the “index” typewriter was born. This typewriter had no keyboard, instead a dial or knob was turned to select the character that was to be printed. 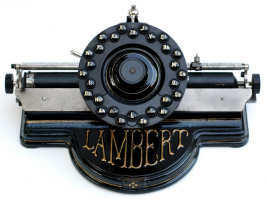 Pictured right: Lambert 1 ~ New York, N.Y., 1902 Frank Lambert a French immigrant spent seventeen years developing the Lambert typewriter. The phone like dial is spring-loaded and is depressed to type not turned. Typing was slow (around twenty words a minute), but the cost was right at $5 to $30. If one had poor handwriting, speed was not the only issue though as one could now produce legible typed work. 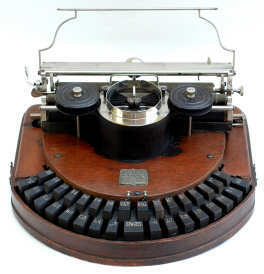 The index machine was popular for small businesses and home use during the 1880s and 1890s, with many remarkable designs being produced, but as secondhand keyboard machines became available and touch-typing was introduced at the turn-of-the-century, the market for the index typewriter quickly disappeared. 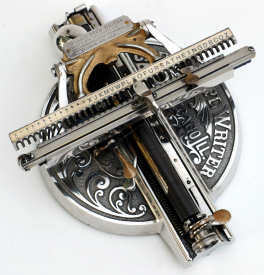 There were many brilliant mechanical engineers who became typewriter pioneers when they applied their skills to the rapidly growing typewriter industry of the late nineteenth century. Pictured right: Hammond 1 ~ New York, N.Y., 1881 This typewriter has a brilliant mechanical design and was one of the classic early typewriters. The inventors, having to avoid patent infringements and pursuing their own notion of the better typewriter, created many ingenious mechanisms to get the printed word onto paper. There was little if any apparent design progression for these first typewriters. A great variety of machines were invented, out of which the most efficient combinations of mechanisms were gradually selected. Some mechanisms, too advanced, disappeared until a later time. Each mechanism solved a particular problem but not always in the best way. There were notable successes and failures! This beautiful little machine was the first typewriter invented by Charles Spiro, a New York watchmaker, who went on to create many superb typewriters. By 1896 many comp onents, combinations and designs had been tried and the winner was emerging. A typewriter with the correct combination of successful components, a typewriter that was fast and wonderful to type on, a typewriter that would usher in the new century, conquer the world, and put an end to this period of rich diversity in typewriter history. The Underwood had arrived. Pictured right: Crandall New Model ~ Croton N.Y., 1886 The first typewriter with a single type element (no type-bars), similar to the IBM ‘Golf Ball’ technology of the early 1960s.